Day Against DRM rocked! Let's keep the pressure on Netflix. Last Sunday, people around the globe spoke out against Digital Restrictions Management (DRM) through many channels at once. 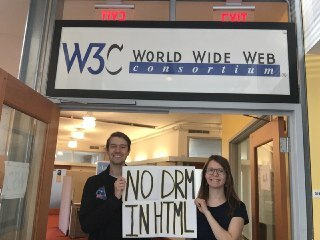 The International Day Against DRM was a confluence of activism to protect our rights and freedoms from the surveillance, unaccountable control, and security threat effects of DRM. 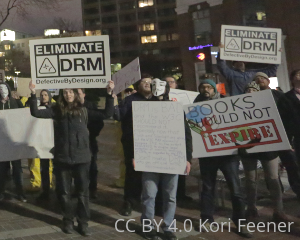 Read more about Day Against DRM rocked! Let's keep the pressure on Netflix. BOSTON, Massachusetts USA — Friday, July 7, 2017 — Yesterday Tim Berners-Lee, the chief arbiter of Web standards, approved the controversial proposed Digital Restrictions Management (DRM) standard for the Web, Encrypted Media Extensions (EME). Signs from a demonstration at Cambridge, MA city hall last week. The inventor of the Web is considering allowing corporate interests to change its underlying technology, extending their ability to control users' computers with DRM (Digital Restrictions Management), undermining Internet freedom, and exposing people to surveillance and criminal threats online. 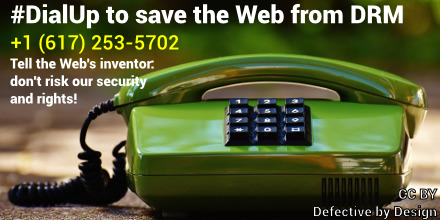 As Web inventor Tim Berners-Lee considers this decision, people around the world are placing hundreds of phone calls urging him not to allow the change. Now a small artist-led group called Ethics in Tech is taking it to the next level—this Saturday, they will march to Berners-Lee's office in Cambridge, MA, to demand he heed the call of human rights groups, tens of thousands of Web users, and his fellow Web pioneers: reject DRM in Web standards and stand up for the free, fair Web that everyone except a handful of big companies wants. Perzanowski (far right) answers skeptical comments from industry representatives. In the last year, we've seen cracks appearing in the foundation of the DRM status quo. Since the beginning of the Web—the age of dial-up Internet connections—the W3C (World Wide Web Consortium) has kept the Web's technical standards tuned in a careful balance that enables innovation while respecting users' rights. On April 13th, that will change. User-hostile DRM (Digital Restrictions Management) technology will become an official part of the Web. Unless we can stop it. Yesterday, the project manager of W3C (World Wide Web Consortium) announced unofficial guidance for organizations facing reports of user-threatening vulnerabilities in their programs or Web sites. Tim Berners-Lee, inventor of the World Wide Web, star of the 2012 Olympics opening ceremony, and one of the best-known tech celebrities outside of Silicon Valley, believes he is powerless. Well, at least when it comes to keeping Web users free and safe. We have fought the practice of Digital Restrictions Management (DRM) for almost two decades. This year, we made breakthroughs in two important DRM battlegrounds: the US Copyright Office and the World Wide Web Consortium. We are gaining ground against the offenses of DRM: malware and spyware foisted on users, remote deletion of cultural works, good-faith security researchers muzzled, and more. Now we need to push the advantage. Defective by Design is supported by memberships and donations to our parent organization, the Free Software Foundation. On Monday, the Foundation launched its yearly fundraiser with the goal of welcoming 500 new members and raising $450,000 before December 31st. 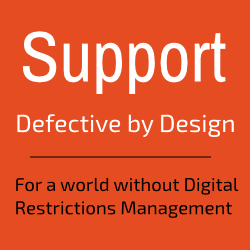 If you have the resources, please support our work against DRM: make a donation or join as a member today. Tim Berners-Lee <strike>created</strike> sold out the Web? Twenty-five years ago, Berners-Lee invented the World Wide Web. 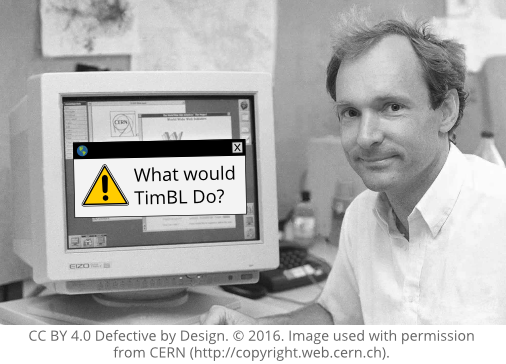 Back then timbl -- as he's known online -- declined opportunities to lock down his creation and established himself as an advocate for a freedom-affirming, interoperable, and universally accessible World Wide Web. Now he's considering turning his back on this vision to make Netflix, Google, Apple, and Microsoft happy. Read more about Tim Berners-Lee created sold out the Web? This week, the chief arbiter of Web standards, Tim Berners-Lee, decided not to exercise his power to extend the development timeline for the Encrypted Media Extensions (EME) Web technology standard. The EME standardization effort, sponsored by streaming giants like Google and Netflix, aims to make it cheaper and more efficient to impose Digital Restrictions Management (DRM) systems on Web users. The streaming companies' representatives within the World Wide Web Consortium (W3C) were unable to finish EME within the time allotted by the W3C, and had asked Berners-Lee for an extension through next year. Read more about Microsoft Edge and Netflix — testing new restrictions by locking out competing browsers? On Tuesday, people all over the world spoke out against Digital Restrictions Management (DRM) with demonstrations, writings, speeches, discussion groups, social media, and more. The tenth anniversary of the International Day Against DRM was a confluence of activism to protect our rights and freedoms from the surveillance, unaccountable control, and security threats effects of DRM. Your browser does not support embedded video. You can watch the video at https://static.fsf.org/nosvn/dbd/halpin-resignation-pledge.mp4. Since 2013, Defective by Design has been fighting Encrypted Media Extensions, a plan to add a universal DRM system to the Web. 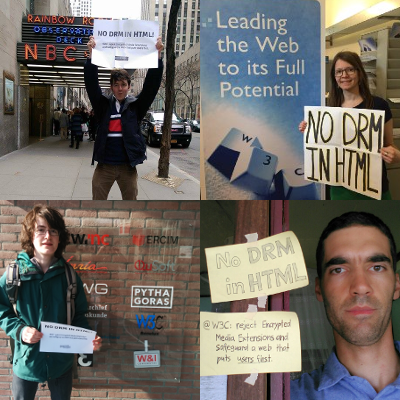 In March, as an element of this campaign, we led the first-ever protest rally at the World Wide Web Consortium (W3C), which designs official standards for the Web. Today: the Intl. Day Against DRM. Take action for digital rights and freedoms! Read more about Today: the Intl. 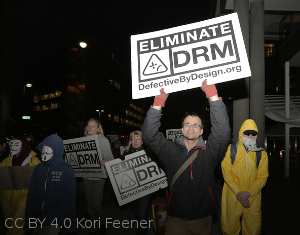 Day Against DRM. Take action for digital rights and freedoms! Just a quick reminder that the International Day Against DRM is coming up this Tuesday, May 3rd. This is the tenth anniversary of the Day, and we're burning the candle at both ends, winding for up for a momentous day of action. In corner offices around the world, those who profit from Digital Restrictions Management are writing their speeches for this Tuesday, "World Intellectual Property Day. "1 This global but decidedly not grassroots event is a project of the World Intellectual Property Organization (WIPO). Yes, those are the same wise folks who convinced governments around the world to make it a crime to circumvent DRM even for legal purposes, undercutting digital freedom, security research, and access for those with disabilities. 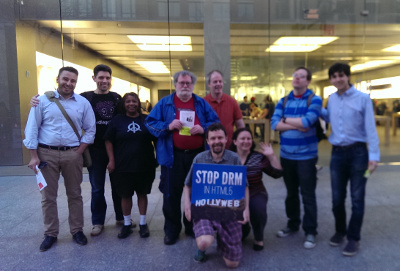 Activists protesting Apple's use of digital restrictions on the 2015 Day Against DRM. In the last year, we've seen those that profit from Digital Restrictions Management (DRM) move to spread the world's most regressive DRM laws through the TPP trade agreement and pressure technologists to add DRM to Web standards. Their intention is to further strengthen the international system of law and technology that lets them weaken our security and curtail our freedom, in an effort to prop up a business model that is exploitative in the first place. Read more about Show them the world is watching. Stop the Hollyweb. Brighten our light — expose DRM! What is the central goal of the Defective by Design campaign? It is to shine a light on the abuses of Digital Restrictions Management (DRM) -- to expose it as digital handcuffs, and motivate people to break free. We may not always notice the handcuffs, but we feel them chafe when DRM installs malware and spyware on our computers, when its owners remotely delete ebooks without warning, and when DRM laws are used to intimidate good-faith security researchers working to hold corporations accountable. Read more about Brighten our light — expose DRM! In the flurry of holiday advertising that happens at the end of the year, many people are swept into buying electronics gifts that are rotten with Digital Restrictions Management, and restrict their users in other ways as well. Our Giving Guide is designed to make it easy for you to choose tech gifts that respect recipients' rights and avoid those that don't. But to have the greatest possible impact, we also need you to spread the word about ethical tech this season. Electronics are popular gifts for the holidays, but people often overlook the restrictions that manufacturers slip under the wrapping paper. From remote deletion of files to harsh rules about copying and sharing, some gifts take more than they give. 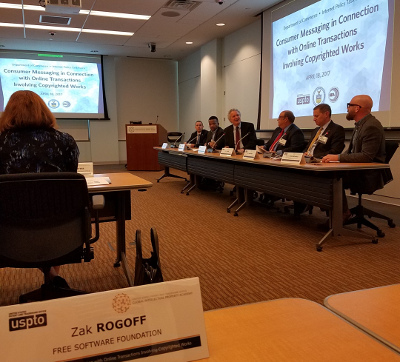 The problems include DRM but go beyond it -- any device running proprietary software, instead of freely licensed software, is a locked box its users can't control or understand.